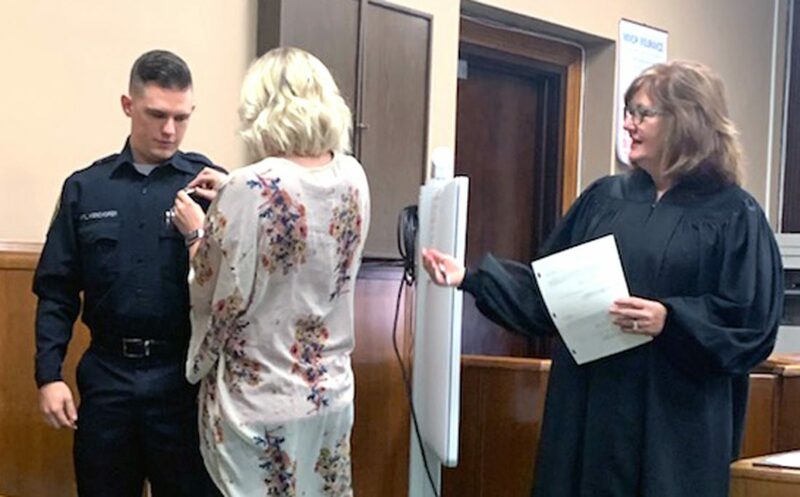 New East Liverpool Patrolman Jonathan Kerchofer had his badge pinned on by his fiance Chelsea Gamble after being sworn in Monday by East Liverpool Municipal Judge Melissa Byers Emmerling. Kerchofer, 24, graduated from Crestview High School and attended Akron University, completing his police training at Eastern Gateway Community College. He is also a member of the Ohio Army National Guard. He has been a police officer the past three years with the village of Lisbon and is filling the vacancy left by the resignation of Patrolman Jake Talbott. Chief John Lane said he expects to hire another officer in the near future to replace the patrolman now serving as the school resource officer. Kerchofer was among those candidates who recently passed a Civil Service exam for patrolman.